There are a fair few famous inventors worthy of getting the cinematic biopic makeover; Benjamin Franklin and his bright spark, the Wright brothers and their flying machine, or perhaps even the Lumière brothers with their mysterious cinematograph. Perennial Oscar nominee David O. Russell has scoured history from Da Vinci to Edison and discarded the lot. Instead Russell has plucked 1980s housewife Joy Mangano, creator of the life changing Miracle Mop, to be the star of his latest film. You don’t need electricity, the internet or even telephones when you’ve got a self-ringing mop with a detachable head made from a continuous loop of 300 feet of cotton. The invention of a mop doesn’t sound like the most enticing premise for a feature length film, but with Russell directing, a man with five Academy Award nominations in as many years, and the heavyweight triumvirate of Bradley Cooper, Robert De Niro and Jennifer Lawrence starring, it’s a tale in capable hands. Unfortunately for Russell and his most reliable troops, not even the Miracle Mop could polish Joy Mangano’s story into 124 minutes of compelling viewing. Before we meet Joy (Jennifer Lawrence), her family or mop, we’re privy to a scene from an absurd, fictionalised, soap opera. It’s overtly ridiculous and comical, an obvious parody that doubles up as a, literally at times, nightmarish representation of Joy’s life. As the soap opera retracts back into the television Linus Sandgren’s camera ghosts through the house introducing the exhausting clutter of personalities that fills Joy’s home. Her mother Terri (Virginia Madsen) is bed-bound glued to the TV, her ex-husband Tony (Édgar Ramírez) and cantankerous father Rudy (Robert De Niro) live acrimoniously in the basement, and her grandmother (Diane Ladd) drifts dreamily through, leaving Joy looking after her two kids along with everyone else. Did I mention her house is falling down too? 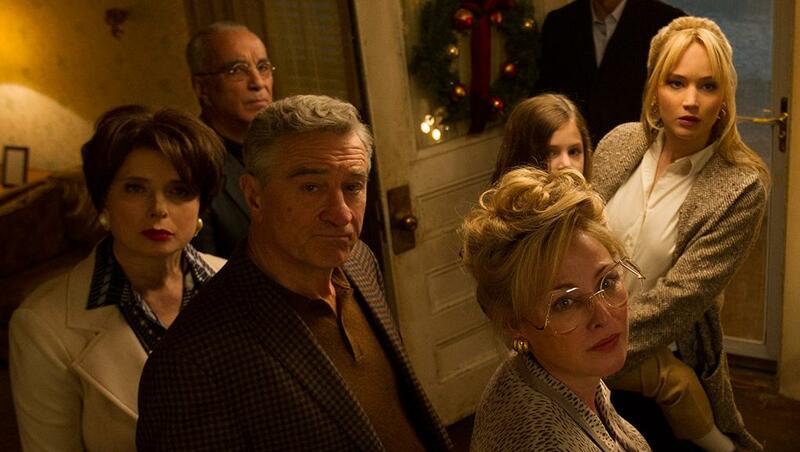 This dysfunctional set up is reminiscent of complicated dynamics in American Hustle and Silver Linings Playbook’, but Joy is riddled with even bolder personalities waging verbal tirades through the domestic war-zone. Witnessing this complex situation we see Joy’s competency along with the pressures exerted on her from all sides – she’s a domestic goddess in essence. However, this cacophony of personalities overwhelms immediately, even more so when Joy’s half-sister Peggy (Elisabeth Röhm) and Rudy’s partner Trudy (Isabella Rossellini) bundle in. Russell’s operatic style of writing only adds to the clutter in front us. There are just too many characters competing for too little space. It’s like being stuck in an eternal family knock down drag out over the Christmas dinner – lots of noise, little purpose to it all. Thankfully the story soon begins to drift away from the domestic asylum and towards Joy’s visions of greatness as an inventor. Once we’ve left the warring factions at home the narrative can hook us into Joy’s big idea; the Miracle Mop. It’s during this period that she finds herself in the headquarters of teleshopping mecca QVC attempting to convince executive Neil Walker (Bradley Cooper) to sell her product. The film’s time in QVC is by far and away the most compelling. Under the zealous preaching of Cooper we’re guided through this magical world of telesales with revolving sets, egotistical presenters, including the late Joan Rivers (aptly played by daughter Melissa), and an army of production members. The set up mirrors the complexity of filmmaking itself. We’re as bemused and awe inspired as Lawrence’s Joy who intrepidly navigates this surreal place over the rainbow, or on the other side of the screen. It’s in the midst of QVC that we see Lawrence at her most dominant and empowering. She’s thrust into the bright lights of television and forced to sell her mop to America. The mop’s benefits appear murky at first, but once Lawrence is on stage it all clicks into place. If we, like much of her family and Cooper, were sceptical about this apparently magical mop’s powers then after her performance we’re in no doubt about its ability to change our lives. It’s a testament to Lawrence’s performance that she makes Joy a woman powerful enough to capture the imagination over domestic chores, but it’s also the superb direction that sells us, the viewer, the dream of the moving image. Something as bland as teleshopping suddenly becomes the dream factory where anything is possible, least of all the mythical American Dream. Cooper’s Walker compares himself to Gone with the Wind producer David O. Selznick, but he only had to sell extraordinary cinema , Walker is successfully selling us the mundane mop – all 50,000 of them. Once again Russell’s films prove to be the perfect platform for its stars to shine. His films are single-handedly keeping Robert De Niro from losing all credibility. His performance in Joy is a reminder that behind the all to frequent bilge he saddles himself with there’s still a fine actor alive in there capable of stealing a scene or two. 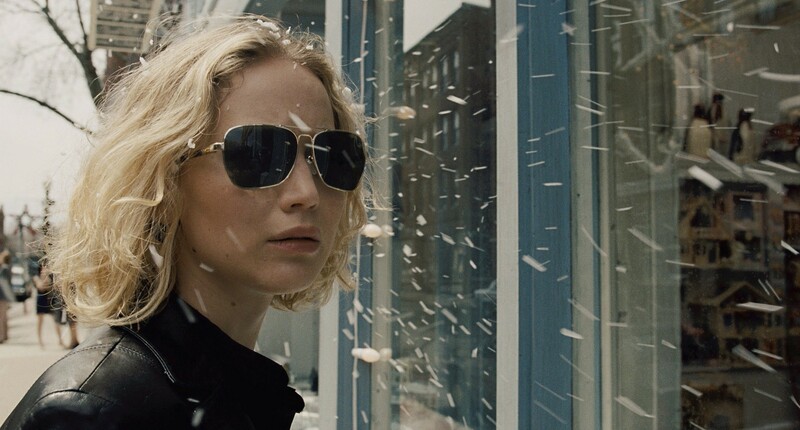 Of course, Jennifer Lawrence once again wipes the floor as blue collar icon Joy. In a film not entirely sure tonally where it lies, Lawrence is capable of mixing comedy, emotion and determination to carry the film. In fact, she’s such a naturally likeable and charismatic presence that we’re not so much rooting for Joy and her mop, but championing Lawrence and that inevitable second Oscar. Unfortunately, despite Lawrence’s best efforts to haul the film along, the narrative wanes quickly in its final third. There’s a predictable muddling of disaster and triumph with a waft of sickly Hallmark schmaltz. Joy’s family slide off the radar until a swift prologue and the final hurdle feels more like a speed bump in contrast to the Hamburger Hill sized issues prior. It’s all just a bit limp and hollow in the end which stems from the dubious narrative foundations. It’s a relief to see a film about the American Dream that doesn’t involve unscrupulous CEOs, psychopathic gangsters or sporting triumph. Beyond Joy’s unglamorous dreams is the novel fact that she is a woman wading through Gordon Gekko’s and Jordan Belfort’s 1980’s to reach the top. It’s just a shame that the clean cut tale of Joy Mangano’s mop isn’t nearly as exhilarating as those tragic tales of grime and greed in America. Russell’s muddled direction doesn’t aid proceedings either. The rabble of characters seems extraneous and exists only to fill Russell’s penchant for melodrama, while dips into the dreamy surreal are integrated half-heartedly. 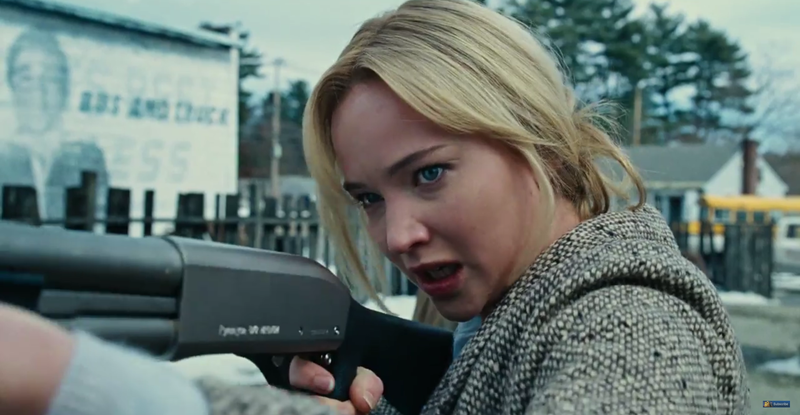 Ultimately, Joy lacks the conviction of its titular leading lady.